Both the balance and the depth of talent in the Upper Midwest High School Elite Hockey League was on display Oct. 29-31 as Team Great Plains – a sixth-place finisher in the regular season – ran off three wins to capture the league’s playoff championship at New Hope Ice Arena in New Hope. Great Plains finished its remarkable run on Sunday, Oct. 31, with a 7-5 win over Team Northeast, a team that also had made an improbable charge to the championship game as the No. 7 seed in the eight-team tournament. The tournament began with many Elite League fans expecting the regular season co-champions, Team North and Team Northwest, to meet again in the finals. 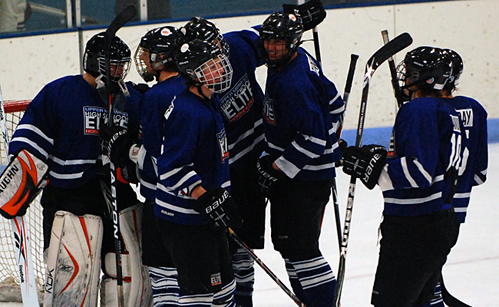 Team Northeast made that an impossible scenario with a stunning 4-0 shutout of Northwest in the quarterfinals. Goalie Tim Shaughnessy of Hill-Murray stopped all 30 shots in earning his first Elite League shutout. His Team Northeast teammates came out fast, getting goals from Wayzata’s Miles Death, White Bear Lake’s Max Birkinbine and Centennial’s Joey Hess in the first period. From there, Shaughnessy kept Team Northwest at bay until Spring Lake Park’s Nick Turbitt scored in the third period to nail down the win. Grand Rapids’ Patrick Moore scored the first of his two goals as part of a four-goal, first-period barrage as Team North – the league’s other regular season co-champ – blew past Omaha. Goalie Dom DeGuiseppi of Grand Rapids made 32 saves and Travis Underwood, yet another Grand Rapids product, had a goal and three assists for North. Moorhead’s Bryant Christian scored twice as Great Plains built a 5-3 lead, then let goalie Bryan Nies of Grand Forks Red River (N.D.) hold on through a furious Team Wisconsin rally for the victory. Nies stopped 12 of 13 Wisconsin shots in the final period for a total of 38 saves. Waupaca’s Brad Navin had two goals for Team Wisconsin. Holy Angels’ Joseph LaBate of Team Southeast scored two goals and Lakeville South’s Justin Kloos had a goal and three assists and Team Southeast – the third-place finisher in the regular season – launched 51 shots at two Team Southwest goalies. Team Southeast had reeled off a seven-game winning streak to conclude the regular season, finished just one point out of first place and looked to be on its way to the finals. Team Southeast’s late-season surge ended in the semifinals against Team Northeast. After Team Southeast’s Bob Kinne of Cretin-Derham Hall gave his team an early 1-0 lead, Team Northeast scored the next four goals to take a 4-1 lead four minutes into the third period. Kinne’s second goal cut the deficit to 4-2, and Lakeville South’s Justin Kloos scored a power-play goal at 17:39 to make it 4-3. Team Northeast’s Zac McCarver of North St. Paul added an empty-netter for the final margin. Southeast outshot Northeast 32-23, but Northeast goalie Blake Cates of Stillwater came up with 29 saves. Great Plains knocked out the league’s other co-champ as goaltender Nies had another great game between the pipes, stopping 35 of 36 shots to send his team to the finals. Nies, a junior, was staked to a 2-0 lead by teammates Shane Omdahl and Josh Erickson, both of Roseau, in the first period. Nies didn’t allow a goal until Garrett Skrbich of Hermantown drew North within one midway through the third period. On Halloween, the title game turned into a wild and crazy affair, with the scoring initiated by Great Plains’ Nick Stoskopf of Warroad just 53 seconds into the opening period. Less than 7 minutes later, Team Northeast’s Miles Death of Wayzata ripped a slapshot from the point to tie the game at 1-1. Stoskopf’s second goal of the game, and a tally five minutes later by Roseau’s Josh Erickson, gave Great Plains a 3-1 lead, but Centennial’s Riley Colvard scored for Northeast at 17:59, setting the stage for a frantic finish. First, Brandon Wahlin of White Bear Lake scored for Team Northwest just 59 seconds into the third period, tying the game at 3. Northwest then went on the power play, but Great Plains’ John Simonson of Grand Forks Central (N.D.) scored a short-handed goal to put his team back on top. That lead lasted less than four minutes, until Centennial’s Joey Hess knotted the game at 4. Carson Gray of Warroad put Great Plains ahead for good at 10:03, and things looked secure when Erickson scored his second at 17:23 for a 6-4 Great Plains lead. But with the goalie pulled, Bloomington Jefferson’s Eric Freschi scored with 18 seconds remaining to cut the lead to 6-5. Off the ensuing faceoff, Shane Omdahl knocked the puck into an empty net, scoring just three second after Freschi and providing the final 7-5 margin. TOURNEY NOTES: After the championship game, 40 players and six alternates were chosen from Elite League rosters to play on Team Minnesota Red and Team Minnesota White in this weekend’s Bauer National Invitational Tournament at New Hope Ice Arena in New Hope. The NIT field includes the two Minnesota teams, Shattuck-St. Mary’s and teams from New York, Texas, Michigan, Massachusetts and Manitoba. For complete rosters and tournament information, visit www.hselitehockey.com.